Incident command at your fingertips. Track resources in real time. Create data for your after action review. Receive incident notifications on your iPhone. One tap opens the incident, second tap kicks off turn by turn navigation. Stay ahead of the curve with Tablet Command on your iPhone. Scale any incident on your iPad. Tablet Command keeps you situationally aware and gives you the tools you need to scale up any incident. "Throw away your white boards. Tablet Command increases our accountability and improves our ability to track our resources. It's very easy to use." Manage incidents directly on a map. Bring situational and resource status into a single view on your iPad. Respond to a wildland fire at night? Satellite images taken during the day provide a daytime view of surrounding homes and vegetation. Create data as a byproduct of each incident you manage. Customizable checklists at the touch of a button. All check-offs are time-stamped and recorded. Tablet Command tracks incident times with precision. A master incident clock is visible on every screen and includes a stopwatch you can use as needed. Colored work time lights give you unit work time status at a glance. Tablet Command is a native app designed to run entirely independent of internet connectivity. Of course having a connection supports the use of map updates and other useful features, but the core app runs flawlessly 100’ deep in a cave. Configure resources, checklists, assignments, and PAR timer and unit work timer durations to match your department’s SOPs. Tablet Command does not try to change the way you manage an incident. It is fully configurable by the user. Report directly from the fire ground at any time during an incident. Time-stamped activity record essentially your ICS 201. Reports include every action made during the incident in a time stamped list, a .CSV file and a screenshot of the incident map. More than just incident command software, Tablet Command Enterprise is an end to end incident response platform that outperforms very MDT / MDC solution on the market today. I don't see a reason why I would look outside TC for anything else. Tablet Command offers me the ability to manage my resources on a technical rescue when crew accountability and safety is key. I like how versatile this app is for ANY incident and it all begins with the customization piece. This is definitely the wave of the future of incident command. For me this is a real-time, agile management tool that can allow me to do a better job as an incident commander, that is going to improve my performance and management ability on the fire ground. Managing day-to-day emergencies, Tablet Command provides a standardized, consistent platform to run any incident. I’ve come to depend on Tablet Command for every incident from navigation to resource accountability, to tracking assignments, reporting, and after action review. Tablet Command improves our situational awareness significantly. Tablet Command enhances our command process and provides for higher levels of safety during emergencies. Tablet Command provides a better way to organize an incident versus a pencil and paper system with clearer and cleaner information. Tablet Command has had a profound impact on the incident management process within the Miramar Fire Rescue Department. Tablet Command is an extremely versatile tool that I have come to rely upon as an incident commander. Tablet Command is a tablet based incident and tactical command software built on the iPad platform. With Tablet Command, an incident commander can tap and drag responding apparatus onto an emergency scene, track progress against critical checklists, and time-stamp every maneuver and benchmark throughout an incident. The 2008 financial crisis and recession that followed had a deep effect on the city’s fire department. in July 2012, Stockton became the largest city in U.S. history to file for bankruptcy. As part of their recovery, Stockton Fire Department looked to Tablet Command’s mobile incident command solution as a powerful MDT replacement and fire ground accountability tool. Tablet Command is an incident and tactical command software built on the iPad platform. 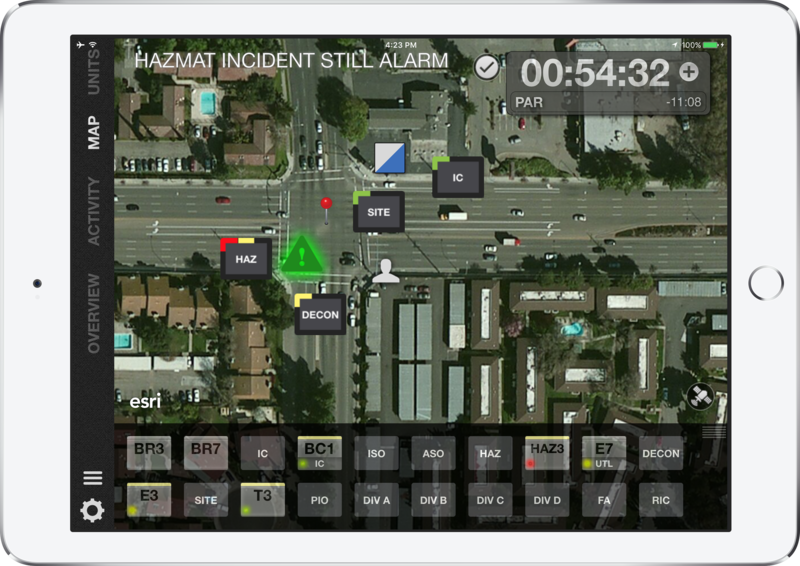 With Tablet Command, an incident commander can tap and drag responding apparatus onto an emergency scene, track progress against critical checklists, and time-stamp every maneuver and benchmark throughout an incident. Tablet Command is more than just a free app. Check out the enterprise features that will increase situational awareness and accountability for everyone in your department.